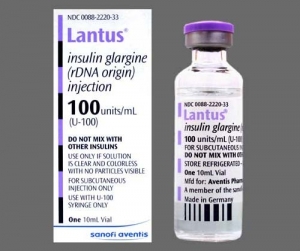 A few years ago I was placed on LANTUS - (insulin glargine [rDNA origin] injection) twice in an effort to control my Type II Diabetes. Insulin has helped millions of Diebetics survive and even thrive but for me the experience was horrible. My doctor never discussed and I’m not sure he was even aware of the possible side effects of daily insuline injections. any menopausal woman knows adding even natural hormones can seriously disrupt the body. To find the possible side effects of Insulin you have to really search the professional pamplet in the box. The warnings are listed deep in the kind of medical jargon that makes your eyes cross and if you’re not careful can put an adult in a coma for a full day. Side effects from insulin are rare but they do happen. In my case it drove me crazy. The first time I was placed on Insulin it took a couple of months for any side effects to appear. Then I began to have violent mood swings. My poor husband had no clue what the problem was, eventually I developed a severe phobia of needles. the finger and doesn’t even hurt. My doctor suggested I seek mental health counseling. About a year later I finally agreed to try it again because my needle phobia had abated and I had decided that my doctor was probably right and the problems I had experienced were porbably not caused by the Insulin. Within a week of restarting the Insulin we were back on the bus to crazy town. couldn’t even look at a needle with out losing my self control. My husband told me to drop the insulin or ‘consider the consequences. I’m not positive what he meant by that but I dropped the Insulin like it was on fire. Soon afer that episode I started seeing a Diabetes speciaist and now I take Byetta, an injectable medication twice a day. I have had no side effects to this mediction and no Irrational fear of needles has presented itself.